The stabilimentum in the first photo really does look like writing in an unknown language. It’s good of you to have turned it sideways to create that illusion. I thought it worked well. It makes the resemblance to writing more obvious: at least, for those of us who write horizontally. I wonder if those whose written language is vertical would see a resemblance to the stabilimentum, too. So this is where embroidery stitch designs come from? At least it’s not a tangled web: no deception here! “Many spiders, especially those who forage near flowering plants, make non-ultraviolet-reflecting webs, then sometimes decorate the webs with special ultraviolet-reflecting silk laid down in flower-like patterns. There are some very patient scientists out there. How fascinating and one can only wonder how much more there is to know about nature’s works and artistry. There is some design at work here and why? 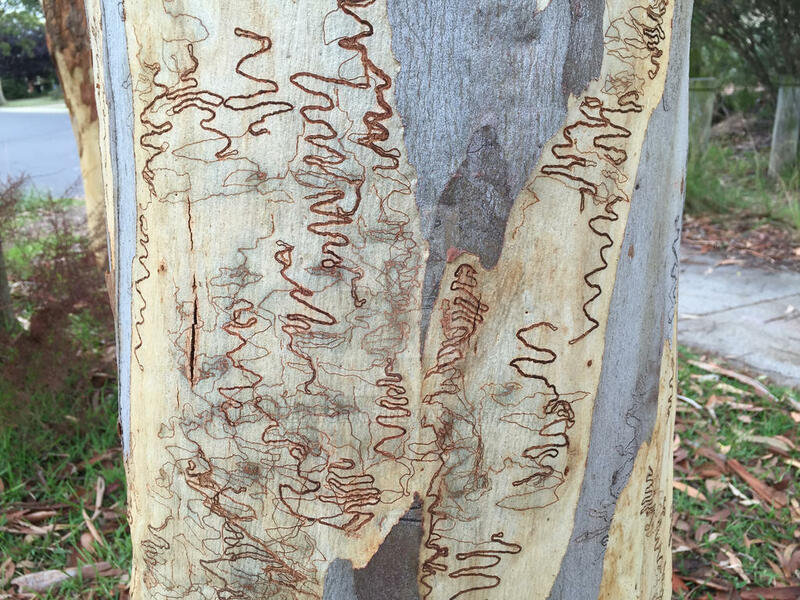 I found a terrific photo of an afflicted tree, and had to laugh. Those are scribbles, for sure; they look like my handwriting before my teachers sat me down with my handwriting exercises. 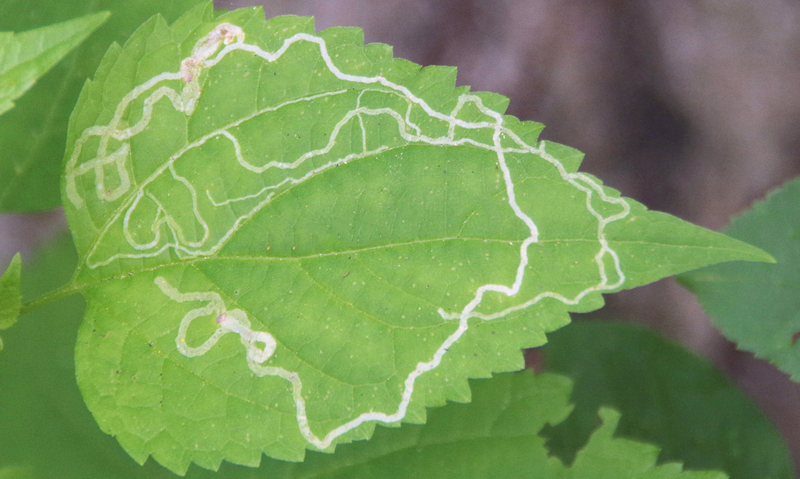 I’ve never seen such a thing on a tree, but leaf miners do the same thing here with foliage. As for how much there is to know about nature — it’s dizzying. I’m doing pretty well with flowers, but that leaves fungus, ferns, trees, insects, fish, beetles… Well, you get the point. I suppose the only thing to do is accept, appreciate, and learn about what nature plunks down in front of us. There’s always going to be something new, that’s for sure. Typically, I have some to many of these spidery beauties in my garden, but this year I haven’t seen one! Thanks for this lovely tribute to these beautiful and interesting predators. I hope next year to see some again. Isn’t it funny how things change from one year to the next? When I first started getting interested in wildflowers, I went back to a place where I’d found a large colony of white prairie gentian, and there wasn’t a single one. Two months later, I found another colony nearly 40 miles down the road. They couldn’t be playing hide and seek — could they? This year, Armand Bayou was covered in these spiders and their webs — also, banana spiders. I do like those. The furry little cuffs they wear look like chafing gear on sailboat rigging. They’re all great fun to watch, so I hope you get a good crop next year. I confess I don’t like running face-first into their webs, but I suppose they don’t enjoy my doing it, either. Nice “counter” poem of “Little Miss Moffatt.”that I really like. I don’t know how you do it, but you do, find that is, some very interesting subjects to photograph. Never in my all my antiquity have I seen a spider web such as the writing spider’s web. And I have seen a few in my time. I always called spiders such as the one you have posted here a common garden spider for lack of better, more scientific word. At any rate this is the only spider that I have not feared. Another name for this spider is ‘garden spider.’ That’s the sort of place where they seem to be most common — partly because there are so many other insects bumbling around in gardens, I suppose. I wish they were less inclined to build their webs across paths, but I suppose it works great for them until some ungainly human walks into the web. The juvenile was the first writing spider I found — that was in 2016. It’s just been waiting around for some friends to show up, so I could put them together in a post. Actually, the zig-zag designs in these webs are the only ones I’ve seen. The spiders are pretty common, but the decorations seem to be less so. I have found some circular stabilimenta, but it’s hard to photograph the spiders in those, since they tend to hang upside down underneath them. The “writing” of your spider’s web looks like that medieval writing called ‘uncial’ which was written with a quill pen. Spiders are fascinating — but at a distance, please. They’re rather octopoid — eight legs, eight eyes, etc., like an octopus with bones. Various peoples’ belief systems associate spiders with weaving. The Diné were taught weaving by Spider Grandmother. The Greeks had Arachne, And then, of course, there’s the ultimate web writer, Charlotte, which is an interesting name for a spider. These web sitters tend to have a “two up/two down” arrangement to their legs, X-like. Of course, I can’t think of spiders without thinking of Walt Kelly’s satirization of Richard Nixon as a tea kettle with 8 legs. With his genius for political satire, Kelly would have had a field day with a particular comb-over. . . When I read ‘uncial’ I thought immediately of the runcible spoon that the Owl and the Pussycat used to eat their slices of quince. I didn’t know ‘uncial’ as a form of writing — at least, I didn’t know the word — but as soon as I saw some examples, I recognized it. It certainly is beautiful. You’re right about that X marks the spot posture. Some seem to think that they do that to reduce their profile — perhaps to make themselves seem less threatening to prey. As for associating spiders with weaving, we do a little weaving ourselves, with our world-wide web. I do wish we still had Walt Kelly. He never lacked for subjects when he was alive and active, but you’re right that he’d be in cartoonist’s heaven these days. The last photo reminds me of a pitching practice net, that a lot of us used in Little League. I guess if the spiders changed the angle of the net, they could use it to field fly balls. And given the number of repairs they have to make to their webs from day to day, I’d say it’s brilliant darning, too! These are so lovely, Linda! As a web designer, I’m fascinated by spiders — outside, preferably! — and amazed at their creations. I’ve seen some HUGE webs this year, contrary from previous years. I haven’t researched why, but I imagine it has to do with environmental changes. The poor dears are probably just as tired of our weather as I am, ha! You know what I suspect? I’ll bet your nice, healthy yard and flowers are encouraging more insect activity — even the kind we never notice — and so the spiders are setting up shop in your area. What halfway intelligent spider would go to a place where there’s not much to eat? On the other hand, a friend in Austin who always has an abundance of these has had almost none this year, and she has a fabulous garden. It seems that nature’s always changing and adjusting, and sometimes we just don’t know why. It may tickle you to know that this species tends to build and repair their webs at night. I imagine you’ve had your own experience of working the night shift on web repair! I’ve never seen or heard of these before, but they are incredible! Not only is the web pattern gorgeous, but the spider who makes it is too! The pattern of the web is similar to a spring (example; the magazine spring in a pistol magazine). I wonder if its purpose may be to keep a specific tension on the web and provide “give” to it to keep a large and heavy insect from breaking the web. It sure does look like a magazine spring. Whether it might serve as a tensioner I don’t know, but I have read that their webs can support insects as large as some beetles, so it makes sense. Here’s a photo of a related species that lives in your area. 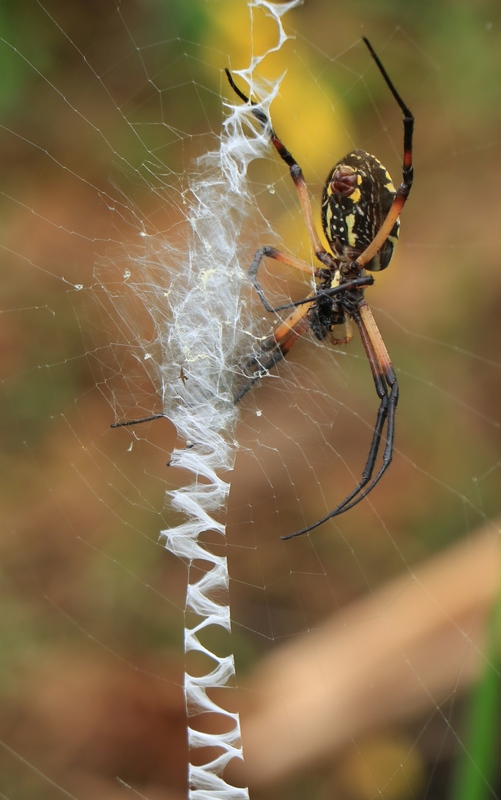 The article says it uses the same zig-zag pattern in its webs, but it builds much closer to the ground that ours does. Apparently yours are most active in October, too — it’s a good time for spider-seeking, if you’re not already covered in snow. Some people seem to see them all the time, but what you see here are the only ones I’ve come across. I am glad to have found such wonderful examples of their web-weaving. Whatever its purpose, it certainly makes the webs easier to see, and it is a delight to the eye. What an interesting web. I’ve never seen anything remotely like it around my area. Like Terry (Montucky), I wonder if it is so strong to provide ‘give’ (and strength) for catching large or heavy insects. 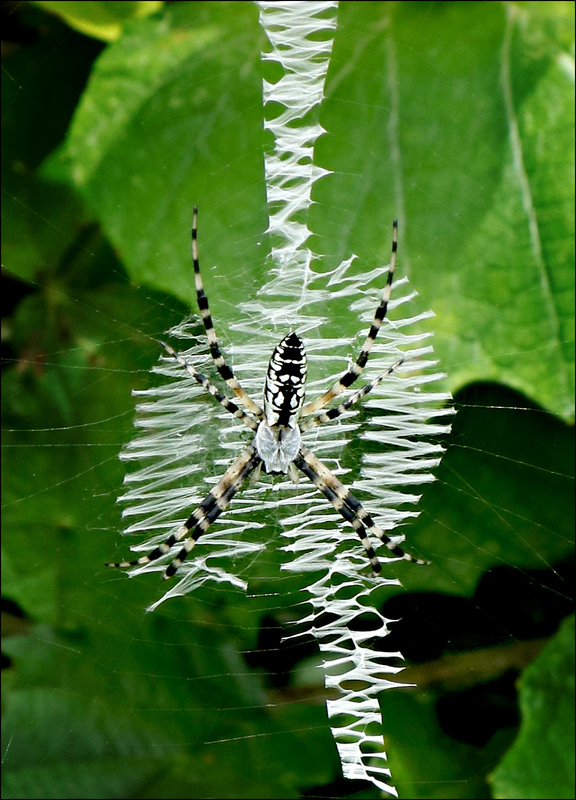 As always, thanks for sharing (this fascinating spider and her web design). I had learned about the role of ultra-violet light in guiding pollinators to flowers, but never had considered that it might play a role in spider webs, too. There’s so much wonder out there, and so much to learn. I was thrilled to find these fancied-up webs. Love your twist on Little Miss Muffett’s Spider, who knew we had such a writerly ally who enchants us with its silken language. Nice detailed images of the spider itself as well as its web work. Sometimes these little parodies just pop up, and if they amuse me enough, I go ahead and share them. I’m glad you enjoyed it! All of these spiders were a little hard to get to. The first one was on the outside of a boardwalk railing, so I had to shoot sideways through the railing to get it. All things considered, I was pleased. It’s always nice to spot them first, before going face-first into their web. Truly. fascinating. The images are so geometric and convey intriguing designs. This isn’t the only form of stabilimentum. Some spiders do circular ones, like this. I’m fairly sure it belongs to the lined orbweaver: Mangora gibberosa. You can see the little spider hiding beneath the silk; it was only about two inches above the ground. It’s not an ‘Argiope’ like yours, but I just wanted to show you since they’re so colorful. Although the article says they reach 3cm in size, I only see the really small ones which only measure less than 1cm. ‘Gasteracantha cancriformis’ is the one most common here, but there are several varieties within the genus. 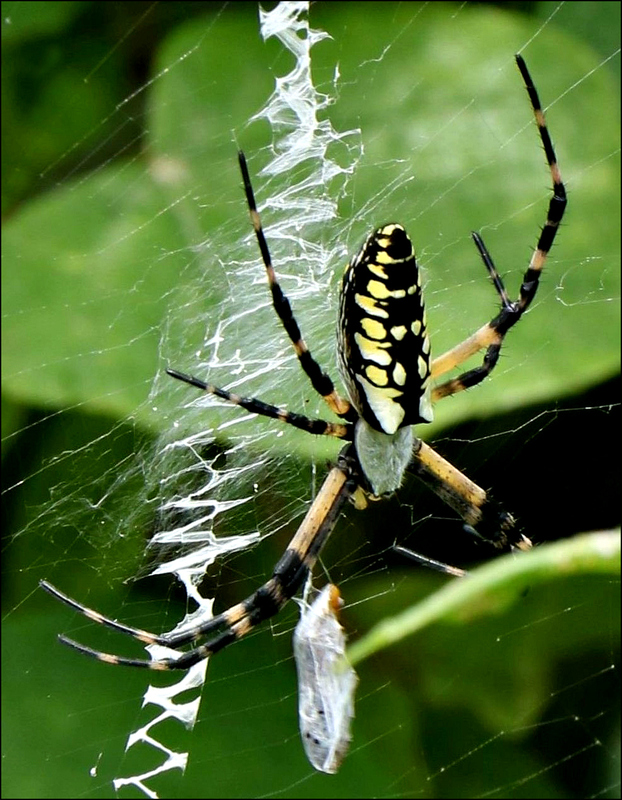 ‘Argiope’ are also known as ‘garden spiders’. What I never paid attention to was their ‘stabilimenta’, so I’m really grateful for this post. It’s made me more aware of their intricate pattern. This is another reason to believe that nature is really the master designer par excellence. Nature has been weaving designs way before Homo sapiens ever attempted to. We have the spiny orb weavers, too. I’ve seen orange, white, and yellow. I have yet to get a decent photo of one, because they’re either hanging upside down when I come across them, or are in the middle of a web that’s blowing in the breeze. They’re wonderful little creatures. When I first saw one, I called it a crab spider because of its shell-like covering. Later, I learned my mistake. One of the little details I learned about the Argiope stabilimenta is that the juveniles tend to make that circular or broader pattern in the middle, just like the one above. The adults seem to content themselves with a linear construction. There’s plenty of speculation about the reason, but that’s all it is. I tried photographing the spiny orb weaver once but found it moved too fast. Maybe the best time to shoot them is when they’re on their web, and mine was simply hanging from one silk thread and it was windy. Also, the ones here are so small that it would just require perfect conditions to be able to get them. I’m sure I must have Argiope spiders in my hard drive. I’ll remember this post next time I look and see whether I find any stabilimenta in the images I have. Very interesting, and what impressive images! I have to admit that I do not like looking at spiders, but the webs – that’s another story. I just never got over that creepy spider feeling, though many other “creepy” animals don’t bother me. Anyway, good for you! (I think I was only vaguely aware of the writing spider, so that makes it better). I still fight the creepiness factor just a bit. There are certain spiders that look like they’re up to no good. The garden spiders and other orb weavers? Not so much. They’re just trying to make a living — although I do hate walking into their webs. When I first found these writing spiders, it was a revelation. We always like to think that everything in nature has a purpose, but I like thinking they’re just a remarkably creative genus. Some like chocolate, some like vanilla. Some prefer spiders, some prefer, for example, the windows in arboretums. That’s part of the delight of life — there’s something for all of us! 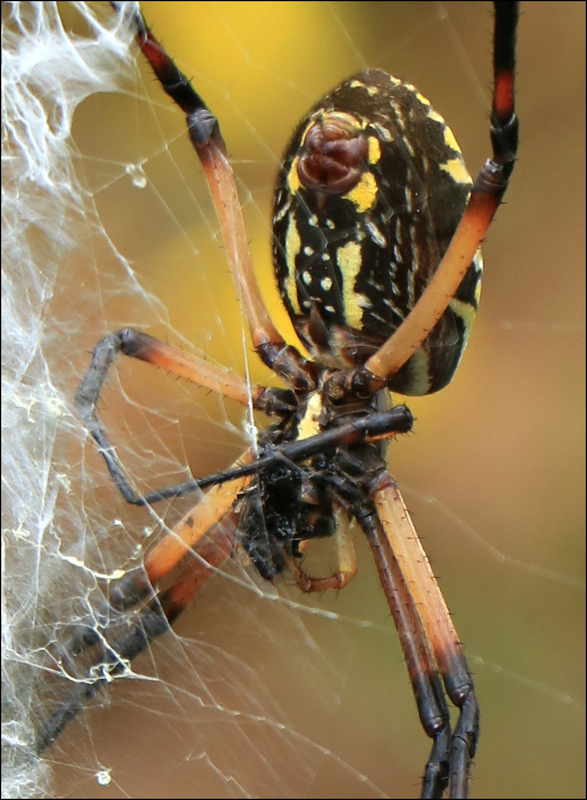 Beautiful spider and web images, especially the last juvenile Argiope, who gets an A+ for her web writing effort. And your writing gets a comparable grade, too. Isn’t that last web something? I’ve come up with every sort of fanciful explanation for it, including an idle conjecture that the spider was enjoying its new-found skill so much it just didn’t want to stop. I’m glad you enjoyed my new nursery rhyme, too. Funny how those bits and pieces from childhood stay with us, ready to be used decades later.